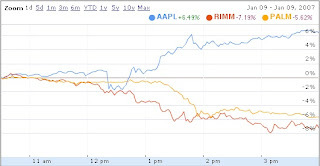 Check out the hourly stock price comparison for Apple, RIM, and Palm. Note the difference in presentation between the Apple and Cingular websites. Intended for different audiences maybe, but feels like different planets. Ohhhhhh, I want! I WANT!